Home Off Beat	Cute Hello Kitty Tricycle Tattoo! Yet another cute little tattoo for Hello Kitty fans out there who love tats too! 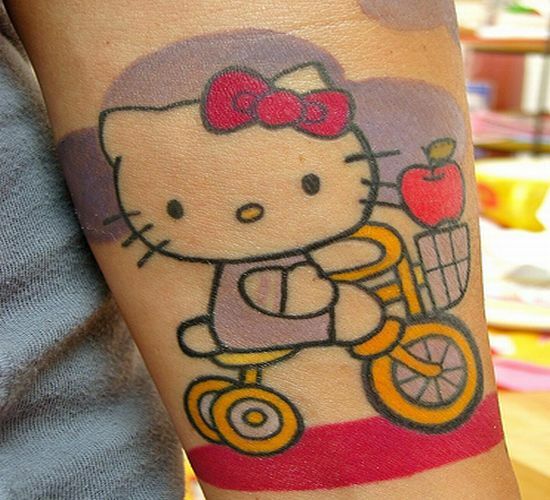 Itâs a Hello Kitty Tricycle tattoo that looks awesome. The artist has played well with colors to make the tattoo look all the more cute. Hello Kitty on a tricycle with an apple in the basket gives us the impression that Hello Kitty is all set to go for an enjoyable day on its cute little cycle. ← Voyager 2 Tattoo: Space back!